The eclipse was captured continuously as the Moon was moving in the shadow of our planet. By clinking on the image above, you can see a wide montage. 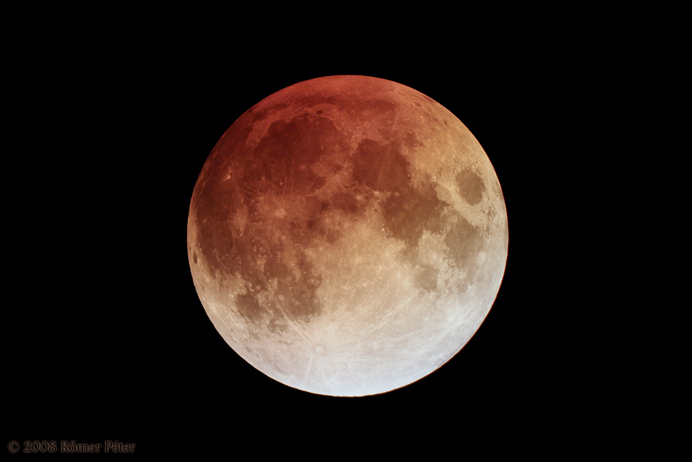 Images were taken about the eclipsing Moon in every three minutes from 0:22 UT to 3:12 UT. The sequence covers the first part of the phenomenon from touching the penumbra until the beginning of the totality. Mother nature allowed us photographing the whole phenomena. We had permanently foggy, badly transparent sky conditions, but with very good seeing. I had to miss out the second part of the eclipse, cause Europe was on the eastern edge of the eclipsing zone. Below the images the actual corresponding status of the eclipse and the used exposure times are tittled. Further data are shown at the bottom of this page. 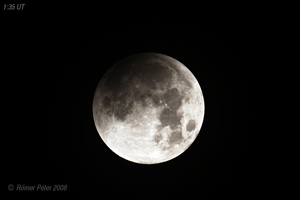 The very first images of the sequence were taken about 30 minutes before the eclipse began. However we had western libration, a thin line of shadow was visible at the western limb. Shadows on Montes Cordillera can be detected on this photo, taken with 900 mm telescope. (note! 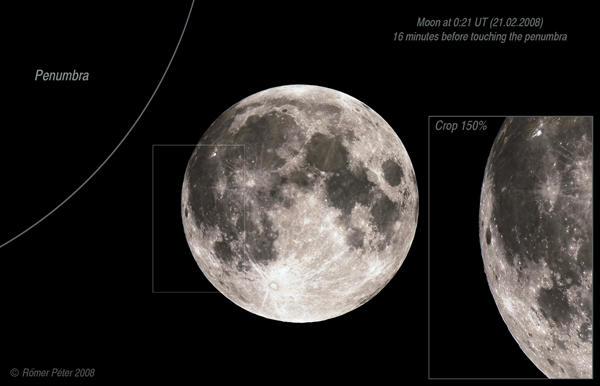 seeing was pretty good)The image shown above, was taken just 16 minutes before the Moon touched Earth's penumbra. Click on it for larger size. The thin shadow at the limb stayed detectable visually, for another 30-35 mins. after entering into the penumbra. Then the area became too dark. This image can be visited as a standalone photograph here! 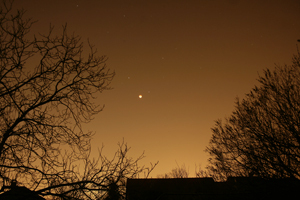 This view was captured at dawn, 3:12UT on 21th February 2008. For the offical data of the eclipse (pdf) click here! We had very foggy sky with good seeing.